The creation of the first alebrijes, as well as the name itself, is attributed to Pedro Linares, an artisan from México City specializing in making piñatas, carnival masks and “Judas” figures from papier-mâché. In 1936 Linares fell ill with a high fever which caused him to hallucinate. In these feverish dreams he was in a forest with rocks and clouds, many of which turned into wild unnaturally colored creatures frequently featuring wings, horns, tails, fierce teeth and bulgy eyes. 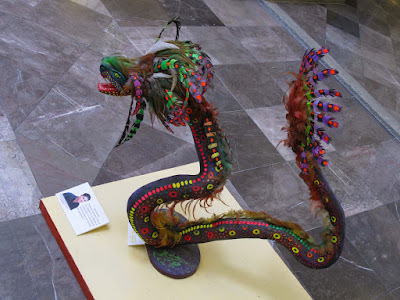 While seeing the creatures, he heard voices which repeated the nonsensical word “alebrije.” After he recovered, he began to create the creatures he saw using papier-mâché and cardboard. Eventually his work came to the attention of Diego Rivera and Frida Kahlo. While Pedro Linares may have dreamed of these creatures, they did not occur in a vacuum. Parallels can be drawn between alebrijes and various supernatural creatures from Mexico’s indigenous and European past. In pre-Hispanic times there was a preference for images with bright colors, which were often fantastic and macabre. What are called “alebrijes” in Oaxaca is a marriage of native woodcarving traditions and influence from Pedro Linares’ work. The Oaxaca valley area already had a history of carving animals and other figures from wood. 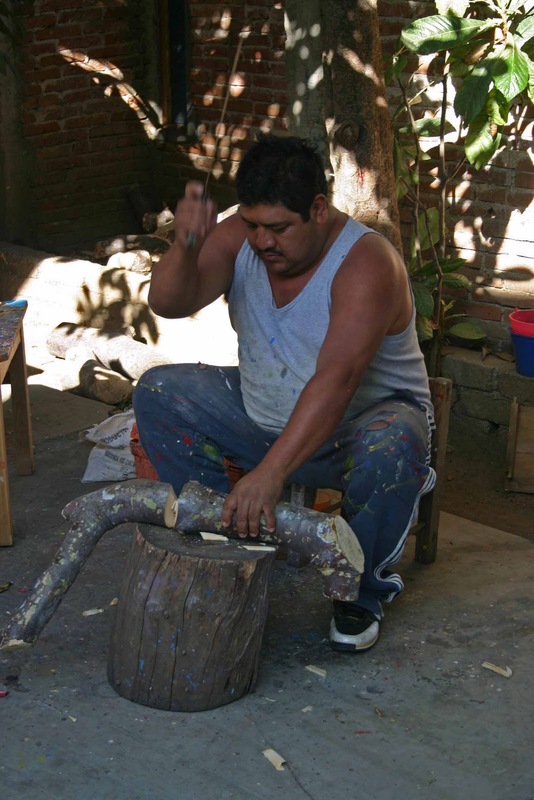 Linares’ designs were adapted to the carving of a local wood called copal. This adaptation was pioneered by Arrazola native Manuel Jiménez. 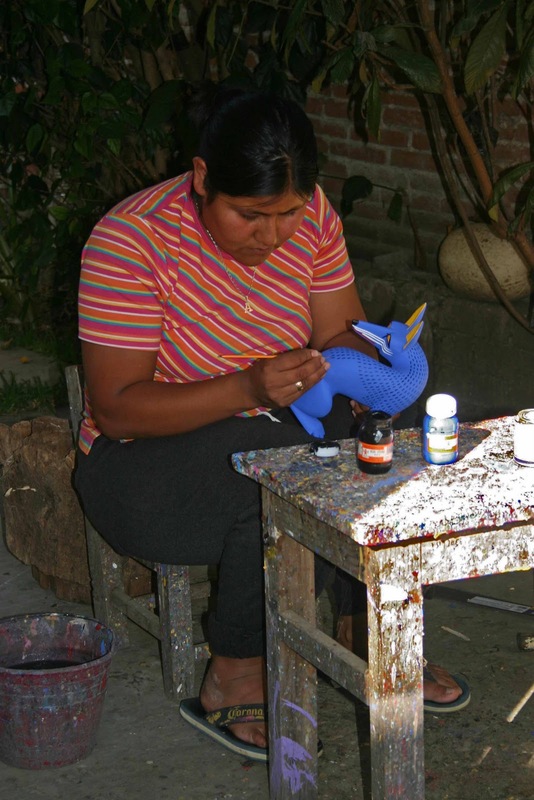 This version of the craft has since spread to a number of other towns, most notably San Martín Tilcajete and La Unión Tejalapan. The success of the craft, however, has led to the depletion of the native copal (bursera glabrifolia) trees. The carving of a piece, which is done while the wood is still green, can last anywhere from hours to a month depending on the size and fineness of the piece. Often the copal wood that is used will influence what is made, both because of the shapes of the branches and because male and female trees differ in hardness and shape. 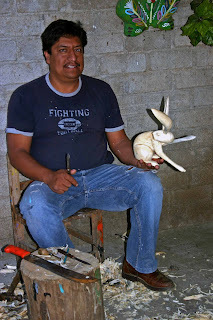 Carving is done with hand tools such as machetes, chisels and knives. The basic shape of the creature is usually hacked using a machete, then a series of smaller knives are used to achieve the final shape. Certain details such as ears, tails and wings are usually made from pieces separate from the main body. 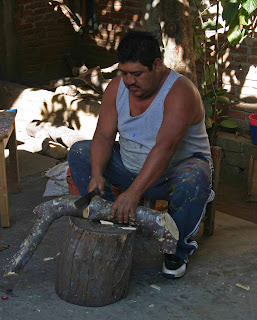 After the carving, the figure is then left to dry for up to ten months, depending on its overall size and thickness. Semi tropical wood such as copal is susceptible to insect infestations, and for this reason drying pieces are often soaked in gasoline and sometimes baked to ensure that all insect eggs have been destroyed. As the figure dries, it is susceptible to cracking. Cracks are filled with small pieces of copal wood and a sawdust resin mixture before painting. 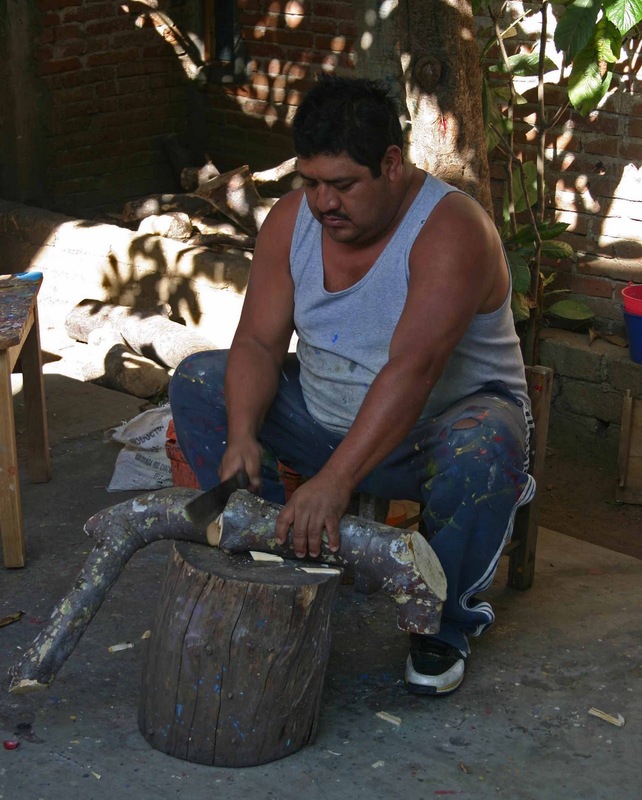 Oaxaca woodcarvings were all originally painted with aniline paints made with natural ingredients such as bark of the copal tree, baking soda, lime juice, pomegranate seeds, zinc, indigo, huitlacoche and cochineal. These colorings were also used for dying clothing, ceremonial paints and other uses. Now most carvers have now switched to acrylics which resist fading and withstand repeated cleanings better. However, some still use aniline paints which have a more rustic look. Painting is generally done in two layers, with a solid undercoat and a multicolored designed superimposed. Artemio Raymundo Ramirez Ibanez, was born in San Antonio Arrazola near Oaxaca. 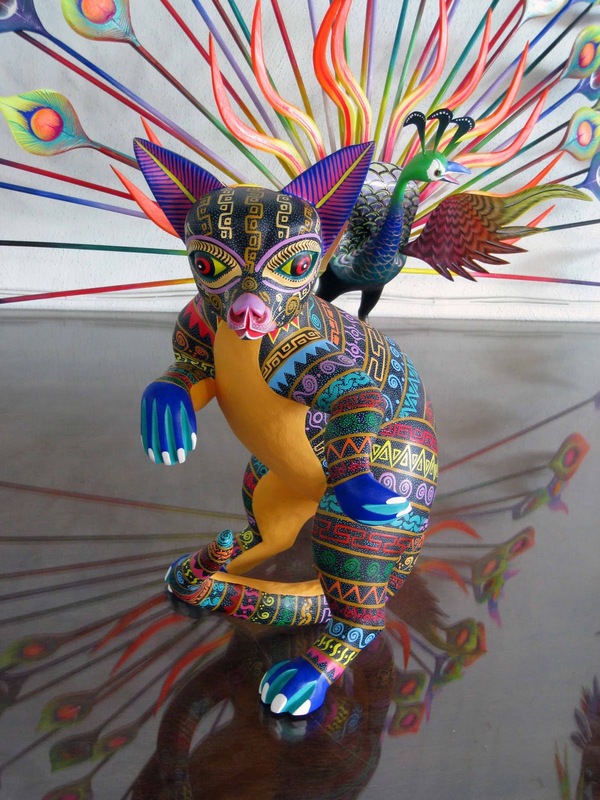 Arrazola is known for traditional alebrijes. At the age of 14 he began artistic wood carving making small figures. By 2008 when he was 26 he had developed his own style, carving dragons from of his imagination. 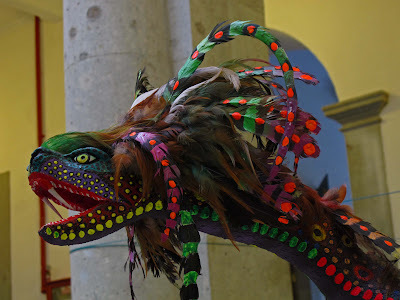 His show of dragons is called, Temo, el señor de los dragones or I fear the lord of the dragons. This display was at the Palace of the Governors in December of 2009. I have more pictures of the work of Artemio Raymundo Ramirez Ibanez on my web album.